Contrary to popular belief, fresh pasta isn’t better than dried pasta. It’s just different. I think they’re both great for quick mid night meals, but fresh pasta cooks quicker and goes well with lighter sauces. I think dried pasta is great for robust rich sauces. I wouldn’t say that making pasta at home is easy, but it is very doable (especially if you have help). We make it every couple of months and have an electric pasta maker which makes life a lot easier. To be honest even though fresh pasta tastes fantastic, if I didn’t have the electric version I probably wouldn’t bother hand cranking pasta. It’s just too much work and fresh pasta is now readily available in most good supermarkets and quite cheaply too. Anyways, this is how I make our pasta at home using the Kitchenaid Pasta Roller and Cutter. Make sure all your ingredients are at room temperature. I keep my eggs and flour in the fridge, and have tried making pasta when everything is cold and it was an absolute fail. In a food processor, pulse together the eggs and flour until you get ‘breadcrumbs’. Tip on to a large plate or bowl, drizzle olive oil and start kneading. Once the dough starts coming together, press into a ball and split into half. Form a disc and flour both sides. Send each disc through the pasta roller on Setting #1, fold over itself and repeat process for about 10 times making sure to flour in between each press. The pasta dough has to be well-kneaded and I find using the actual roller works best for me to produce a nice silky dough. Once you’ve done this about 10 times to each disc, reduce the setting to #2 and send each batch of dough through. Repeat a couple of times and then reduce setting to #3. Remember to flour on both sides between each press. By this stage you should get lovely sheets of pasta. You then need to decide how thick you want the sheet and how you’d like to cut the pasta. For spagetti, I like to roll the pasta at #4 and then use the Kitchenaid cutter at speed 1. The slower speed ensures that the pasta is cut through and the strands are not stuck together. 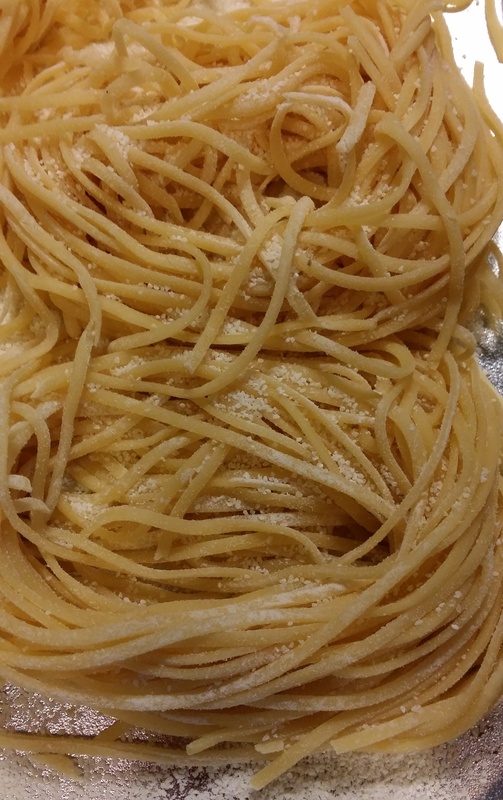 I toss the pasta in semolina, roll into small nests and arrange in a single layer on a tray. This goes in the fridge until ready to use or can be frozen and stored in ziploc bags. Enjoy!